September 17th was a beautiful day in New York. Around 7 pm, David Ake met the team he had gathered at the Acoustic Recording Studio in Brooklyn and less than six hours later, the contents of that disc had been recorded. The day before, the quintet had met a first time in order to quickly “fly over” the scores. And here is this jewel chiseled in a very short time by goldsmiths unparalleled! 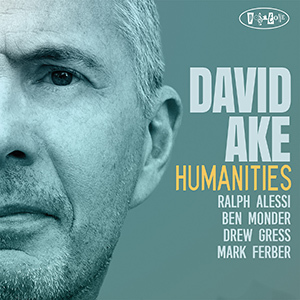 Humanities is again the magic of jazz that results from “the remarkable joy, the optimism that human beings can feel when they create in a spirit of mutual trust, respect and openness” writes David Ake ” despite all the difficulties, tragedies and political situation of the nation. A few days earlier, he had to evacuate Florida where he resides and take refuge with his family in North Carolina to escape Hurricane Irma. Let’s listen to what is happening here after the storm. A great lesson of jazz given in all modesty but with what fervor by magnificent musicians: David Ake, attentive and inventive pianist, Ralph Alessi, always relevant trumpet-poet, Drew Gress and Mark Ferber in a total rhythmic complicity and, the extra -terrestrial of this exceptional session, Ben Monder, quiet hurricane and stratospheric guitarist who enrubanne this music of electrifying volutes. Superb!